Madita, a New Typeface from Animography. If you work with After Effects, or you are a graphic designer you might be familiar with Animography, the company that produces animated typefaces that are fully customizable. I’ve been a fan of these guys for quite some time, and always love it when a new release comes out. In the past Animography has done a pretty straightforward promotion of the product, they show the typeface animating, and the variations that can be achieved with it. All of this is an effective demonstration of what they are trying to sell, but the promotional animation for Madita is a winner. Animography Shows the typeface in use, but blends it with a catchy little story, some wonderful animation, and shows how the typeface can be used in a project before wrapping it up with a simple question, “Where can I get this typeface?” The design and animation by Philip von Borries does a really nice job of showing Madita in use, and combined with the narration, the story hooks you and keeps you interested until the marketing punch at the end, which hopefully gets viewers interested in the font. Even if you aren’t a designer, or animator, the video is worth watching simply for the visuals and the nice little storyline. Posted in Animation, Design and Art, Typography and tagged Advertising, Animation, Animography, Marketing, Storytelling, Type, Type Design, Typeface, Typography on August 24, 2016 by Author. TOMS “One for One” VR Campaign for Peru. Over the weekend I was in Chicago for a bit of R&R, good food, and fun. While I was there I decided to hit the Miracle Mile for a bit of research and investigation into marketing trends, displays, and general design trends. I tend to find that merchandising, and packaging for some of the larger retail giants seems to be a good indicator for emerging design trends. 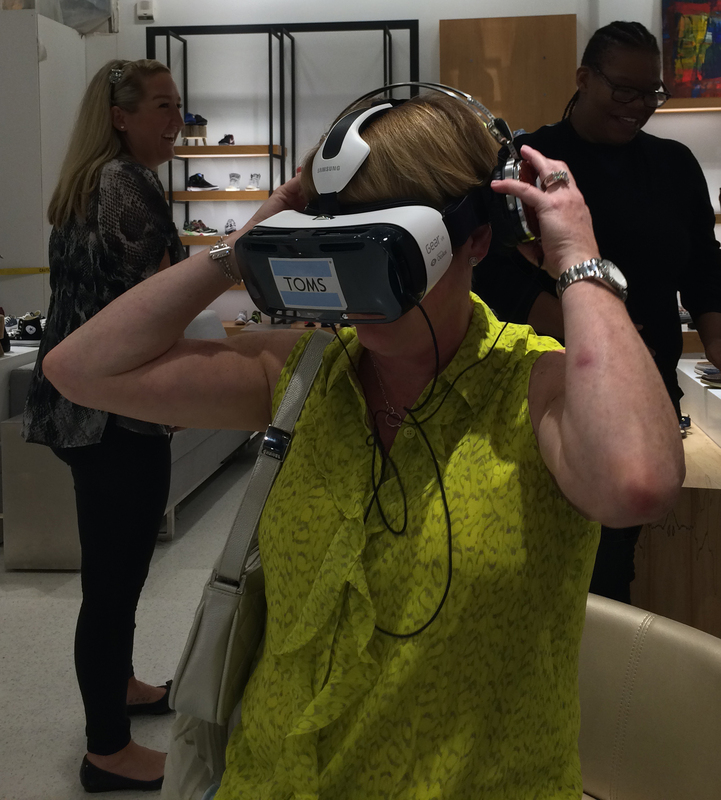 While I was at Nordstrom’s I noticed that TOMS Shoes had a number of VR headsets and headphones set up, and the sales staff was encouraging people to try them on. Since I am a huge fan of technology, and using it to extend the marketing experience I decided to investigate. What I found was a 3 and a half minute video with solid surround sound audio. The message wasn’t about TOMS shoes, instead it was about the TOMS One for One campaign that is a massive omni channel campaign for good. TOMS One for One provides shoes, water, sight, safe birth and bully prevention world wide. I have been trying to find an example video to link in here but haven’t been able to come across anything. So, I’ll just have to describe the experience, and if you are in Chicago or a Nordstrom’s that has the set up, check it out for yourself. Basically this is a full immersive experience where you are introduced to children in a village in Peru, and volunteers that explain the program and ask you to get involved. Everywhere you look, the world moves with you. It is Virtual Reality in action. You look down, you see the earth beneath your feet. Up and you see the sky. Straight ahead and left to right, video of the children in the village interacting with you, the virtual camera. The message is straight forward. Buy TOMS shoes and Tom’s will donate a matching pair of shoes to a child in Peru. There is a secondary call to action, asking you the viewer to get involved by going to the TOMS One for One website, where additional options are available. It’s pretty damn impressive. The video quality could have been a higher resolution, but you don’t really care when you are experiencing this. The audio was fantastic. And while, I tended to forget at times what the campaign was about, I was distracted by the cool tech, it did what it was supposed to. It kept me thinking about it, got me involved, and connected me to the Brand. In addition to the VR set up, Tom’s has also launched a number of micro sites, a YouTube Channel, Pinterest, Instagram, Twitter, and Facebook accounts all of which are coordinated to drive traffic back to the main site and encourage the visitor to donate and give. Very cool stuff. Great campaign. Posted in Advertising, Technology and tagged Advertising, Immersive Experience, Marketing, Nordstroms, Omni Channel Marketing, Philanthropy, Shoes, Social Media, Technology, TOMS, TOMS One for ONE, Virtual Reality, VR on September 1, 2015 by Author.